The heat recovery ventilator is not a glamourous contraption. It is nothing to look at. And it is hard to tell from its name alone exactly what this appliance does! But there is a reason all-new construction in the Toronto area is now required to include the installation of a heat recovery ventilator. This nifty gadget is not just a simple solution to the complex problem of indoor air quality. It is also like a continuous savings account that trims your utility bills year-round. Best of all, the heat recovery ventilator takes an active role in saving the planet every single time your heater or air conditioner powers on. In this post, we share how the heat recovery ventilator can save you money right from day one! 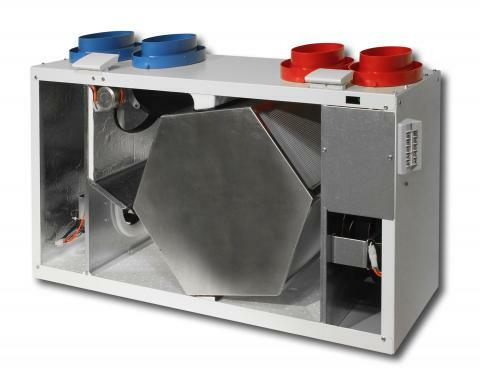 At its most fundamental, a heat recovery ventilator is a system for air exchange. It’s also for improving the quality of your indoor air. Specifically, it’s an energy conservation system that moves airborne heat energy around to reduce the workload on your air conditioner and heating system. A heat recovery ventilator is also an air balancing system that helps improve temperature and moisture-controlled air delivery to each room of your space. How can one device accomplish all of this? Read on to find out! A heat recovery ventilator maintains two separate air streams. One draws fresh air from outside into your space. The other (exhaust) extracts oxygen-poor, stale, toxic air and moves it back outside your space. These two air streams are completely separated from one another. In past decades, heat recovery technology was in low demand. This was because most homes and workspaces were built with some amount of natural ventilation, so fresh air was constantly seeping in while stale air exited organically. But in today’s energy-efficient, air-tight construction, stale indoor air is a very real issue. This has created an urgent demand for heat recovery ventilation technology to manually infuse indoor spaces with fresh, oxygenated air and remove toxic stale air. If you are reading this post because you are already researching heat recovery and energy recovery ventilation equipment for your home or workplace, you may be wondering what the difference is between the HRV and ERV. Both the HRV and the ERV are quite similar in some ways. They both exchange air. They both help improve indoor air quality by flushing stale indoor air and replacing it with fresh, oxygenated air. They both assist with improved air flow from room to room. And they can both help to ease issues with indoor air humidity, especially in naturally humid rooms such as the bathroom and laundry room. The main difference between the two units is that the ERV also transfers humidity seasonally. If you live in a climate with vastly different seasonal humidity levels, the energy recovery ventilator will automatically transfer humidity as needed to keep your indoor air humidity levels balanced year-round regardless of the humidity load in your outside air. So your choice between an HRV and ERV is partly one of evaluating your climate and partly one of personal preference. For instance, if you or someone in your family suffers from asthma or chronic allergies, an energy recovery ventilator that can maintain a more humid indoor air balance may be the smarter choice. The main way a heat recovery ventilator (or energy recovery ventilator) systematically lowers your monthly utility bills is by transferring airborne heat energy to warm your incoming fresh air in winter and reversing this transfer process summer. For example, with summer heat extracted from your incoming fresh air stream and sent back out through the exhaust vent, fresh air entering your home is already cooler than it would otherwise be. This means your HVAC system works less hard and draws less power to cool your air to the desired temperature. In winter, with heat extracted from the outgoing stale air stream that would otherwise just be wasted and used to preheat incoming fresh air, your HVAC system draws less power and uses less energy to warm your indoor air to the desired temperature. For maximum savings, the government of Canada's website suggests purchasing an Energy Star-certified heat recovery ventilator or energy recovery ventilator. According to the U.S. Department of Energy, an energy recovery ventilation system can recover up to 80 percent of heat energy that would otherwise be wasted and use it to pre-heat incoming air. Similarly, the Cold Climate Housing Research Center found that a heat recovery ventilator can extract and reuse up to 90 percent of otherwise wasted heat energy. While it is true that a heat or energy recovery ventilation system will draw a bit of extra power on top of your existing HVAC system to do its job, what it can recover or exhaust in relocated heat energy typically translates to at least a 50 percent reduction in monthly energy bills seasonally. Cleaner Air Is Just a Perk! One of the perks you get from the HRV’s system of separate incoming and outgoing airstreams is that toxins headed out of your home cannot inadvertently creep back inside. Pollen, bacteria, volatile organic compounds, combustion off-gassing and other toxins are naturally removed from your indoor air as your HRV cycles on and off. P.S. Don’t forget to sign up to receive Chip’s Tips by email each month—it's free!